Affordable, family-friendly and serving some of THE best food, Andy's is a top pick for lunch. 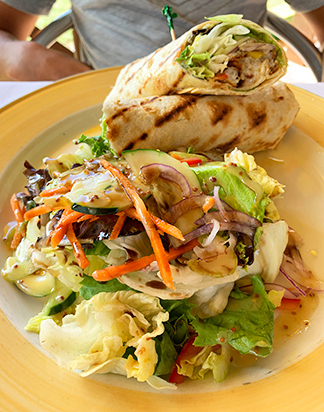 The wide variety of options on their menu keeps us coming back... from burgers and sandwiches, to fresh salads (Andy's Chicken Salad is even topped with onion rings! 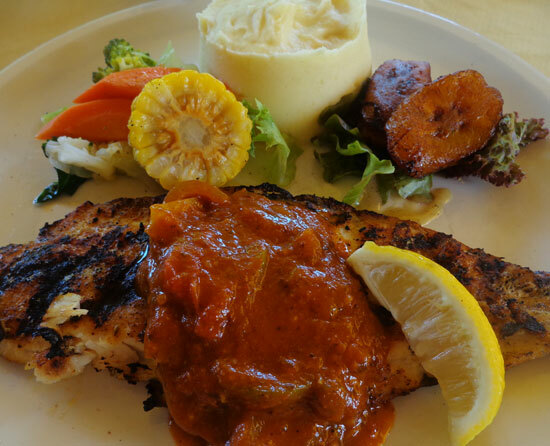 ), to mouthwatering daily specials (think salmon topped with a creamy caper sauce or coconut curried Mahi Mahi), it is all delicious. 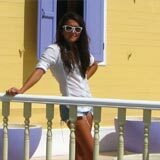 If you are lucky enough to know about Anguilla, then you know that it's known for picture-perfect beaches, warm and welcoming people, and excellent dining options. 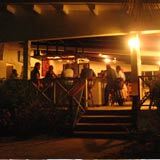 My favorite three restaurants in Anguilla that are not seaside are the old Zara's in Shoal Bay, Tasty's in South Hill, and Andy's in The Valley. Zara's and Tasty's have more of a tourist following than Andy's, likely because they have been established much longer. Andy's Restaurant is slighty more casual than the aforementioned but the food is similar in flavor profile and options. 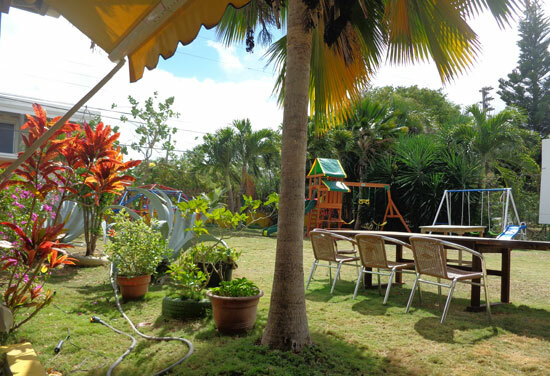 Set back off of Lower Airport Road in The Valley, Andy's is covered and open-air with a lovely side lawn which is excellent space if you have children with you. The lawn has monkey bars, a swing-set and a trampoline to keep youngsters busy while they wait. 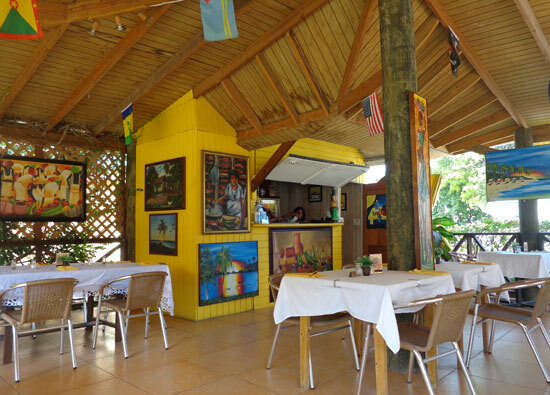 The dining area has a pitched wood ceiling decorated with Caribbean flags and Regional painting adorn the walls. 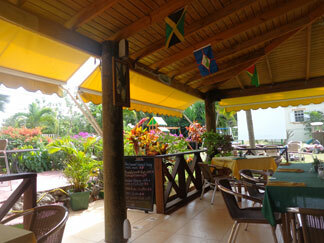 It is an comfortable environment and the staff is courteous and friendly. 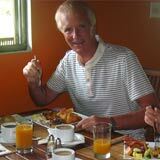 My friend and former General Manager of The Viceroy Anguilla is the person who first told me about Andy's Restaurant. I'm so glad he did! My mom and I tried Andy's for lunch and were immediatley impressed. The popular Andy's Chicken Salad which we found to be unique, fresh, and full of flavor still to this day ranks as one of my mom's favorite salads ever. It's even topped with a couple fried onion rings. 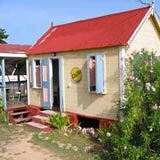 My Grilled Fish Burger (which is actually a filet of fish) is my favorite fish sandwich on Anguilla. It comes with a salad or fries. I always ask for their curried mayo on the side too. It is absolutely delicious, cooked perfectly, and is plenty of food for $12 US. The trouble with Andy's menu is that everything I have tasted has been great so it makes it difficult to choose upon each return visit. 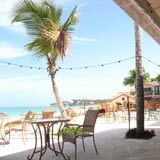 The menu is well-rounded and begins with soups and salads including: Chicken Soup, Pumpkin Soup and Conch Chowder. Prices are $7 - $10 US. He offers a variety of salads: Mixed Garden, Feta or Goat Cheese Salad, Caesar, Grilled Fish, Sauteed Shrimp, and of course the famous Andy's Chicken Salad. Prices are $9 - $18 US. Wraps and Sandwiches are popular lunch items at Andy's and are great to pick up to-go too. The wraps are stuffed with cucumber, peppers, lettuce, celery, red onion and a light curry mayo sauce. They come with either chicken, tuna, steak, fish, or shrimp. It is all served with a side of salad or french fries. I choose the salad and oh my! It is packed of veggies and tastes oh-so-good every time! Light and healthy! Prices are $9 - $14 US. The sandwiches and burgers range from $8 - $12 US and include a Tuna Sandwich, Grilled Chicken Sandwich, Hamburger, Cheeseburger, Grilled Fish Burger and Andy's Big Bad Burger. They are all served with either fries or salad. 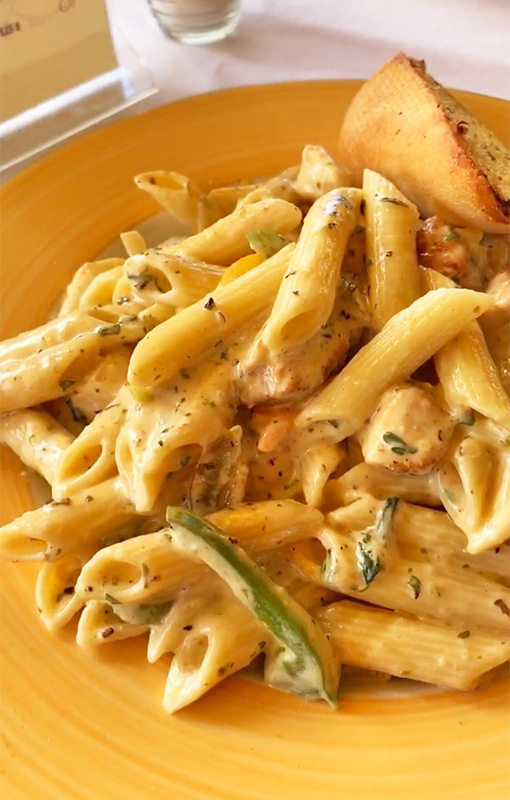 Pasta dishes are rich and abundant: Vegetable Pasta, Spaghetti Bologne, Chicken Pasta, Shrimp Pasta, and I recommend the Stir-Fry Vegetable Steak Pasta or the Fish Pasta. Andy does not skimp! Prices range from $12 - 18US. The pastas come with a nice slice of garlic bread, too! 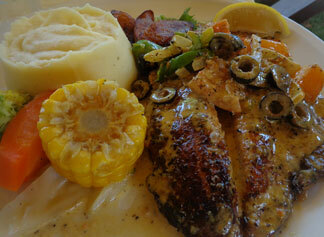 Andy's menu finishes with entrees of fish, beef and poultry. Fish/Seafood entrees include Breaded Fillet of Fish, Pan Seared Grouper, Grilled Fish, Creamy Garlic Shrimp and Breaded Shrimp. Prices range from $16 - $20 US. These entrees come with vegetables and a starch. Note when I say starch (which may be rice or mashed potatoes), it would be unfair for me to not point out that when I chose the mashed potatoes as a side, I found them to be as good as my grandmother's mashed potatoes and they are tough to beat! Lastly beef and chicken entrees include: Creamy Mushroom Steak, Kahlua Steak, Grilled Sirloin, Frishing Chicken Wings, Teriyaki Chicken, Creamy Mushroom Chicken, and Grilled Chicken Breast. They range in price from $12 - 20 US. Andy has daily entree specials posted on a board as you arrive to the restaurant. Typically, each one sounds very appealing and vary from seafood to pork and beef. If you are looking for something light and healthy, Andy's even has a fresh juice bar! 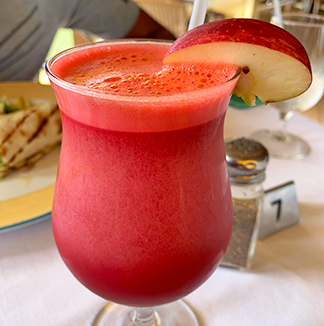 On my last visit, the juices listed included: lemonade, fruit punch, beets & carrot, apple & pear, kiwi & Apple & pineapple and carrot & beets & apple. The bottom line on Andy's is that the variety is wonderful. The taste and temperature of the food is always right on and the price is fair. I can't say anything negative about the place. One notice to those who are sensitive to open-air spaces in the Tropics… Bugs tend not to bother me too much here in Anguilla with a few small exceptions. Of the many times I have eaten at Andy's (lunch and dinner) I can only recall one time, in the summer, when the mosquitoes could have backed off a bit otherwise they have been a non-issue for me. If you are sensitive to it, just plan ahead to cover yourself in light-weight pants and sleeves and you should be safeguarded and most definitely don't let my notice keep you away from this very pleasing restaurant. I have a feeling once you find Andy's, you will add it to your list of places to eat at often! Directions: If you are coming from the West, take a right at the round about by the airport, so you are driving on the road that runs parallel to the airport. Take a left at the end of that road (past the airport). Continue on that road. You will drive past ANGLEC. Andy's will be on your left. Hours: Daily for lunch. Dinner Thursday-Saturday. Closed Sundays.